My takeaway: Financial freedom and success happens one step at a time. Having a plan and sticking to it with focus and discipline is what brings the victory. My takeaway: I’m not going to bless my children with a piece of bread only for it to be moldy. Something can’t be a blessing from God and at the same time create strife and conflict in my life (like that great deal on the new car [blessing] that I can’t afford the payments on later [sorrow]). More often than not if there is sorrow going on in my life it’s selfishly inflicted through poor decisions. My takeaway: God is no respecter of persons. In His eyes, I’m no better than another person simply because I’ve achieved a measure of wealth. His love and the gift that He offered extend to all mankind. My takeaway: A big secret to my success rests with my incredible wife. She deserves far more credit than I give her. My takeaway: The choice to provide for my own is always a right one. If done properly, my personal and financial legacy can live on for multiple generations…hopefully indefinitely. My takeaway: God wants the first bite of pie. I should give to Him first from the continual increase of my wealth. After all, since He created the earth, all that is in it belongs to Him anyway. I’m simply a steward of the resources He provides. My takeaway: In his book The Millionaire Mind, author Thomas J. Stanley noted that “millionaires rated integrity [being honest with all people] as the number one factor out of 30 that explains their economic success.” They didn’t seek after wealth first, desiring instead that personal character and a good name was the distinguishing mark of their life. My takeaway: Debt brings risk and oversight from a lender. This puts me in a subservient position and creates a lack of freedom. The ability to make choices is limited until that debt is paid off. I’d rather be free than at the beck and call of another. My takeaway: Nobody owes me. The success I attain will result from the depth of my own work ethic. There you have it…my top 10 favorite proverbs about money. As I mentioned, there are many more verses about money in the Bible. I encourage you to take a look if you are interested in further study. Hopefully, at least these were an encouragement to you today. Questions: Do any of these verses stand out to you? Do you have any favorite proverbs about money or Bible verse dealing with money? Prior Post: Building Trust With Your Audience: Should a Blogger Care? Proverbs 22:7 is the biggie for me. Not so much the rich/poor part, but definitely the debt/servant part. When you are in debt, you can’t choose to do what you want to do. You have to pay the bills and sometimes this means working a job you dislike because it pays the bills. By not having debt, you can do whatever you want, regardless of the pay. Much more freedom by being debt free. I think the main emphasis in that verse definitely lies with the debt/servant part. I don’t want to be beholden to anyone and be subject to their regulations/rules. Number 7 definitely stuck out to me. I subconsciously tend to think I’m better than those who don’t track their money, or those who don’t care about their net worth, etc. But in all seriousness, God doesn’t care about any of that. We are all His children, not matter how rich or how poor you are. “…I subconsciously tend to think I’m better than those who don’t track their money…” That’s real easy to do. The trick is being proud of your own accomplishments without looking down on others for their failures. I’m still working on that one as well. Hi Brian – New-ish reader to your blog and wanted to say thank you for sharing these proverbs which I found very encouraging! I particularly enjoy #4 which reminds me of The Parable of the Talents (Matthew 25:14-30). Honoring God with my possessions, with His blessing, is the motivation and inspiration for my blog. Like you, I want to be a steward of what He provided me with. Great selections Brian. I personally enjoyed Proverbs 22:7, because it reminds me why I need to stay out of debt and become my own master, so to speak. Of course, I’m sure that will change in the future. Once I have more money, that means I have more money to give away to improve the lives of others. Being your own financial master brings the freedom to give to others just as you describe. It’s a worthy goal to be sure. When I look at people that gave given themselves to their cause, like Mother Theresa and the pope, it’s amazing how frugal they live, always giving their time and energy to the less fortunate. “…giving their time and energy to the less fortunate.” And those like that are some of the most well-respected people around. I’m by no means Catholic, but this pope is an inspiration! And of course Mother Theresa. These are excellent passages. I think its really valuable to reflect on these elements of the Bible when struggling with how one’s relationship with money ought to be. It can get murky at times, but these can help bring clarity. “…clarity…” I always seem to come back to the Bible for that. It’s so easy to get off course. One of my favorite verses is Mark 12:41-44, about the widow giving all she had. I’ve been fortunate to know people who give all they seemingly have, not just in financial resources but in time and talents too – their humbleness and generosity is remarkable. Whenever I read this verse I think of two people specifically – Mother Teresa and an acquaintance named Tammy. That’s a great one Karen. Proportionally, of her entire wealth, she gave more than the wealthy religious leaders were doing. You included my favorite one – Prov 23:4. Being rich is fine, but God doesn’t want us working ourselves to the bone just to get rich. It’s a reminder that there is more to life than work and we have to be careful that we aren’t working for the wrong reasons. When I read that one it really hit me Kirsten. God surely doesn’t care that we get rich…we can use our wealth to bless others. However, if it’s the driving force of our life it’s probably hindering our relationship with Him. It’s not worth it if that is going to happen. Great post! 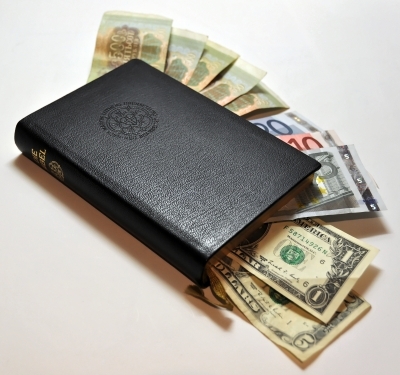 I do enjoy reading what the bible says about money, but I need to devote more time to just reading it in general. I am finding that I am quite a bit busier right now visiting family or friends, working on the blog, and just work in general whether it be the day time job or stuff to do around the house. Still never a good excuse. “…I need to devote more time to just reading it in general.” Agreed…I think we are all there at some level. I try to make it the first thing to do in the morning, even if it’s just five minutes. If I don’t, the day completely gets away from me.